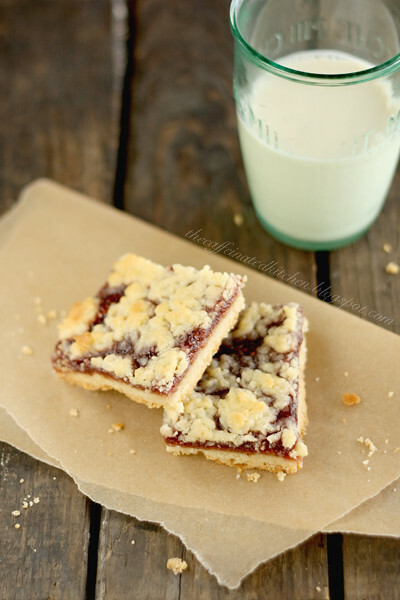 These raspberry crumb bars are, in a word, perfection. I may or may not have eaten 3 the day I made them, but that's irrelevant. 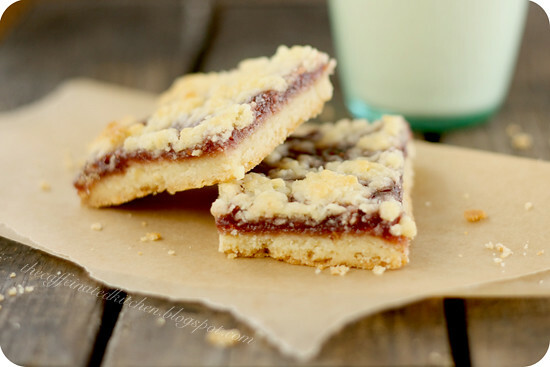 The recipe is long and tedious, but don't let that discourage you, the payoff is well worth it - the shortbread is so buttery and crumbly I didn't even have to strategically place the crumbs for my photos. If that's not quality shortbread I don't know what is. To make the shortbread: Using a stand mixer fitted with the paddle attachment, cream together the butter, granulated sugar, and confectioners' sugar on medium speed for about 5 minutes, or until the mixture is light and fluffy. Stop the mixer a few times to scrape down the bowl and paddle. Beat in the egg yolks and vanilla on medium speed for 2-3 minutes, or until thoroughly combined. Scrape down the bowl and paddle again. In a medium bowl, sift or whisk together the all-purpose flour, cake flour, baking powder, and salt. On low speed, gradually add the flour mixture to the butter-sugar mixture and then mix for about 15 seconds, or until the flour mixture is totally incorporated and the dough is evenly mixed. Scrape down the bowl again and make sure all of the flour mixture is thoroughly incorporated. Lightly flour the 8-inch dough disk and two large sheets of parchment paper. Place the dough between the sheets of parchment, and roll it out into a rectangle about 13 by 9 inches and 1/4 to 1/3-inch thick. Carefully peel off the top sheet of parchment. Trim the edges so the rectangle has fairly neat sides. Transfer the bottom sheet of parchment with the dough to a baking sheet. Trim the parchment paper so that it fits the baking sheet. Bake for about 20 minutes, or until the shortbread is light brown. Remove the shortbread from the oven (leaving the oven set at 350 degrees F), let cool for 10-15 minutes, and then spoon the raspberry jam on top of the still-warm shortbread. 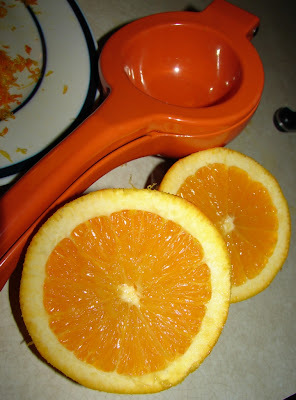 Spread it in an even layer with the spoon or with a rubber spatula, covering the surface. The heat of the shortbread should soften the jam enough to make it spreadable. Return the baking sheet to the oven and bake for another 20-25 minutes, or until the top is lightly browned. Let cool completely on the baking sheet on a wire rack. When cooled, sift the confectioners' sugar evenly over the top. Trim the edges again, then cut into bars. Today is Katherine's 8th birthday. One minute that seems perfectly realistic and the next I think how can she possibly be that old? The park is one of her favorite places. 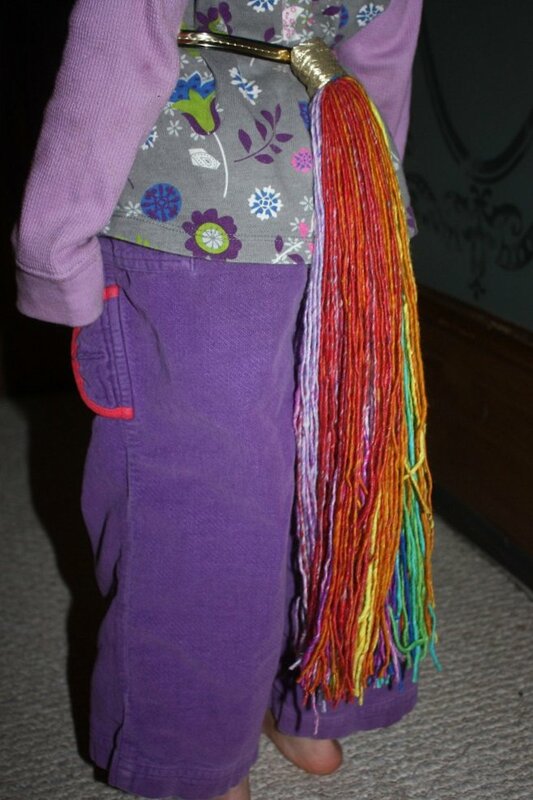 At 8, she loves to list her favorite things: books, American history, sausage, the color turquoise, doing math problems, playing the violin, the Titanic, dogs, sewing with Granny, going to school. She dreams about living on a farm and raising horses and going to a one-room school. She can't wait until she is old enough to cook all by herself and do her homework in cursive and play real songs on the violin. Sometimes she wishes that she had a dozen brothers and sisters. And sometimes she wishes she was still an only child. But mostly, she likes being Rachel's big sister. ...and there she is. Happy 8th birthday, Katherine Guo Dan. just got home from bible study. i'm always a little worn out after leading. i love it but i always need a little time to turn of my brain and just not think for a bit! nothing better than a big salad and a nice quiet house! this weekend was busy! we painted. it's our family room. it was a yellow-white color. since the room doesn't get direct sunlight it is a hard room to pick a color for. i went with polar bear white, to brighten it up a bit! it looks much better! we also had some friends over and had a ton of fun! i made two types of enchilada casseroles. one of the recipes you can find here. If you have not done so before hand, boil the boned chicken breasts for 20 minutes, remove skin and set aside to cool. 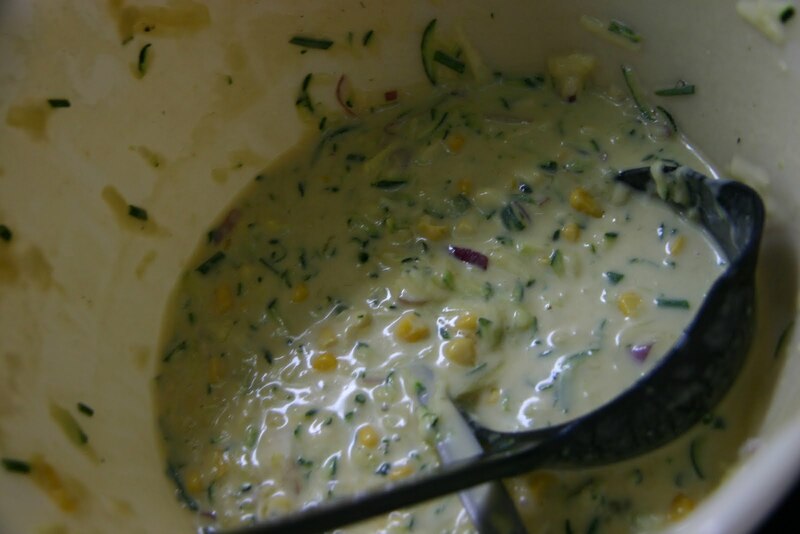 Combine cream of mushroom soup, mushrooms, chopped green onions, olives, chili powder, cumin, sour cream and mix thoroughly. In a flour tortilla place a line of shredded chicken with a line of roasted chilies, pour sauce on top so that the chicken and green chili slice is covered, roll and put seam side down in pan. Continue with this process until the pan is filled. Cover rolled tortilla with grated cheddar cheese, and sprinkle garnish of a few more olives on top. 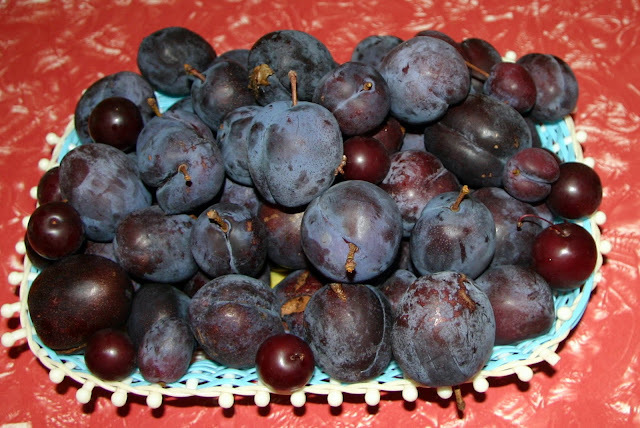 We managed to save some of the plums from the cockatoos, but they were quickly ripening in the summer heat. A small revelation. 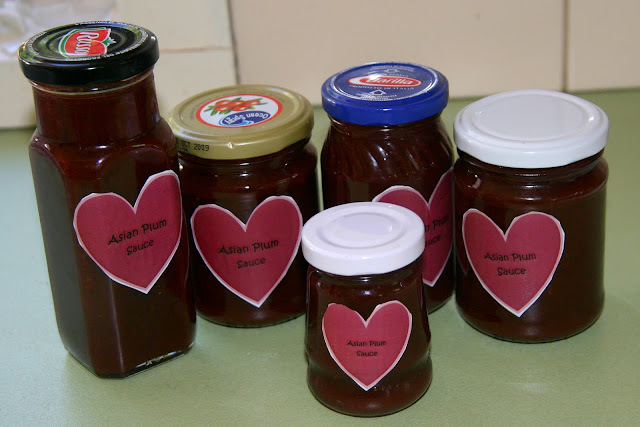 I am a very poor labeller of my preserves. I put them on the shelf to finish cooling then forget about them. Chutney can look like jam and this sauce was looking a little close to raspberry. Part of the put off in labelling is fiddling with sticky labels in the printer. These I just printed with our new laser printer on plain copying paper and stuck on with PVA glue. Of course I did forget to date them, but at least I know what's inside. I think they will disappear pretty fast anyway so the missing date shouldn't be a problem. This was so quick and easy and gives many more possibilities to insert pictures and use different shapes. They'd look prettier with some fabric on top, but I think these few jars are for my eyes only. The only downside to the recipe is that there wasn't more. Sieving out the skins does remove a fair bit of bulk. 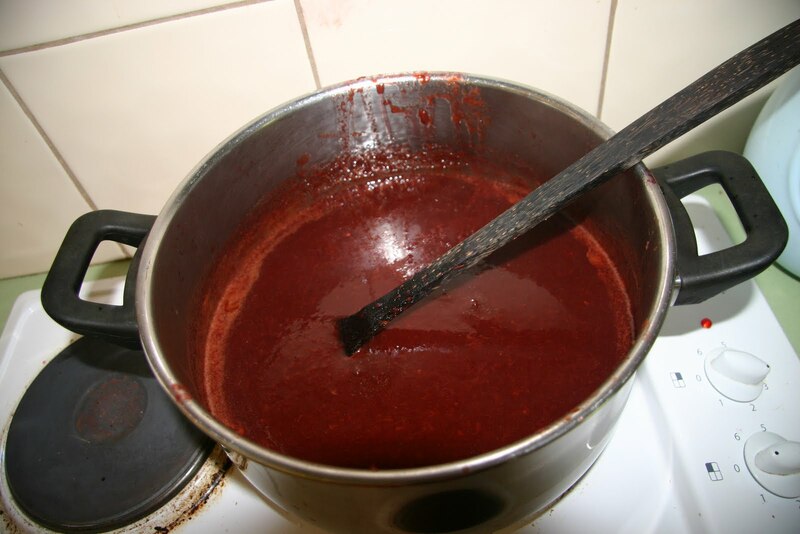 Forget to read the recipe, and put it all in a pot and leave overnight in the fridge as this sauce making is taking too long. Sieve out skins pushing with wooden spoon - discard remaining contents of sieve (this felt wrong). Return to pot and simmer some more - maybe another 2 hrs. 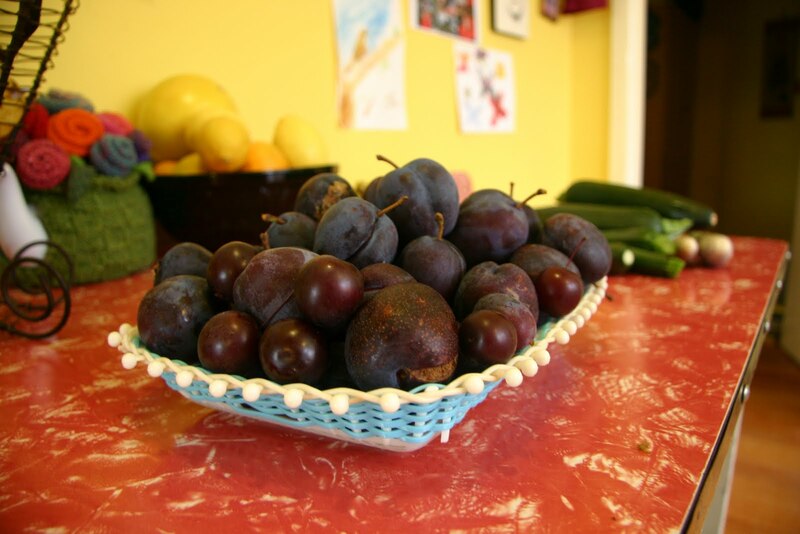 Place a saucer in the freezer. To test if it's ready put a teaspoon of sauce on the cold plate - if the sauce stays apart when you run your finger through the middle it's set, if not simmer some more. When ready place into hot sterilised jars. If I had my time again I would consider blending the sauce after the hard spices are removed so as to extract maximum goodness and bulk from the skins. 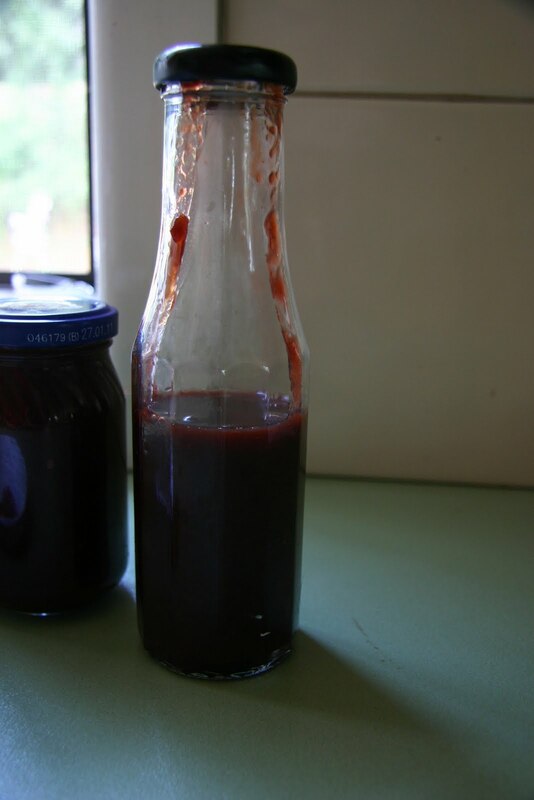 A wonderful morish plum sauce with the spices, ginger and garlic all playing a part. 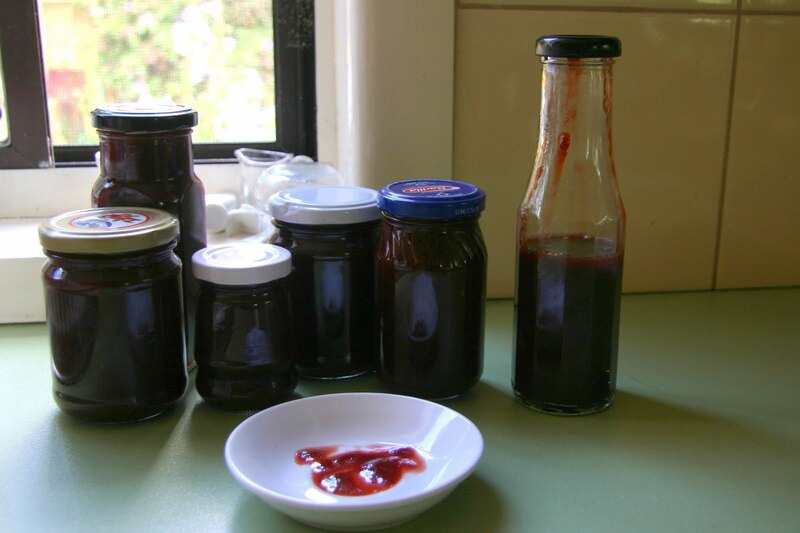 Plum sauce has always been a personal favourite, my mum regularly made it when I was growing up, and it was my sauce of choice as a kid. 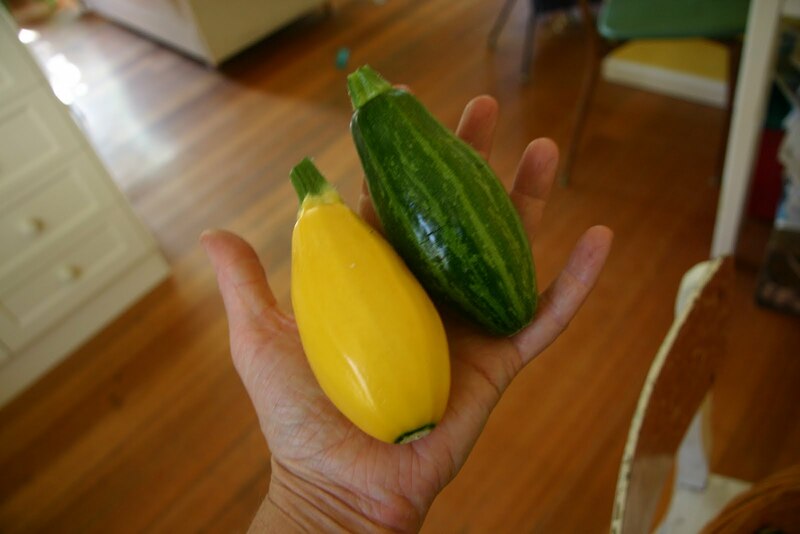 These are the outcome of seeds I collected from a neighbours regular looking yellow squash last year- they're making the most beautiful Squachinnis. 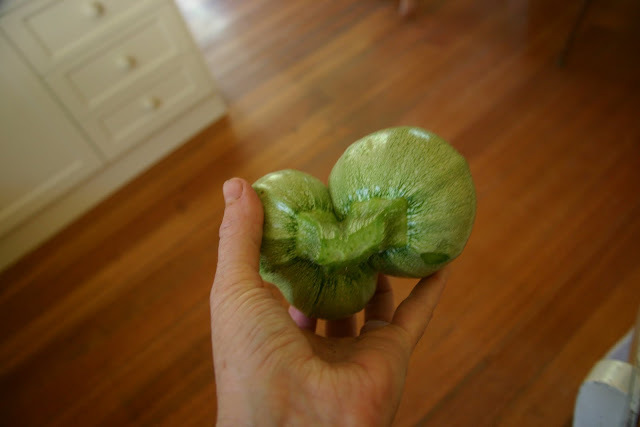 Zuchinni Round de Nice - a mutato with 3 fruit merged into one. 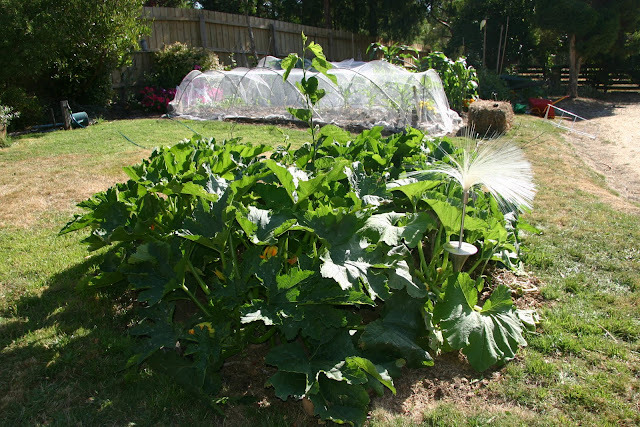 Like the rest of Victorian's with vegie patches, we are now getting oodles of zuchinnis. It seems that once they start, there is no end in sight. 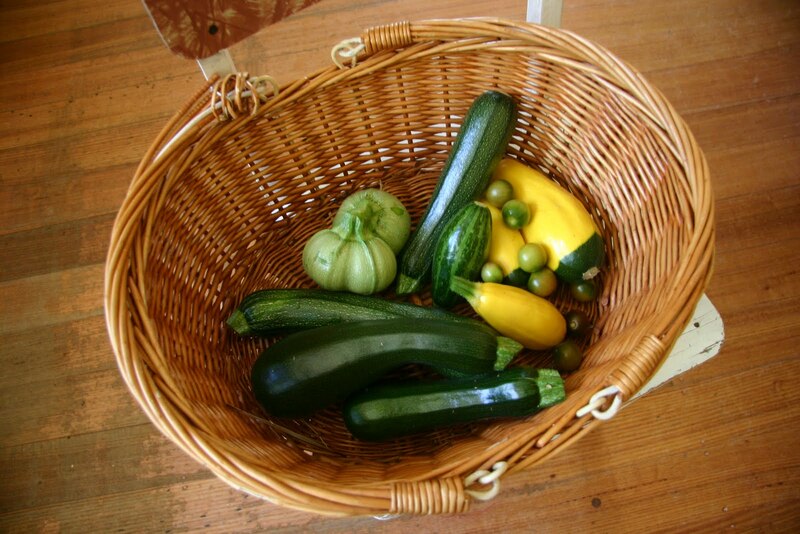 We did manage to give away a bag full last week but a whole new lot are awaiting harvest. I'm taunting the kids with threats of zuchinni for dinner each night, and following through on many occasions. Mix all ingredients together, will seem quite sloppy. 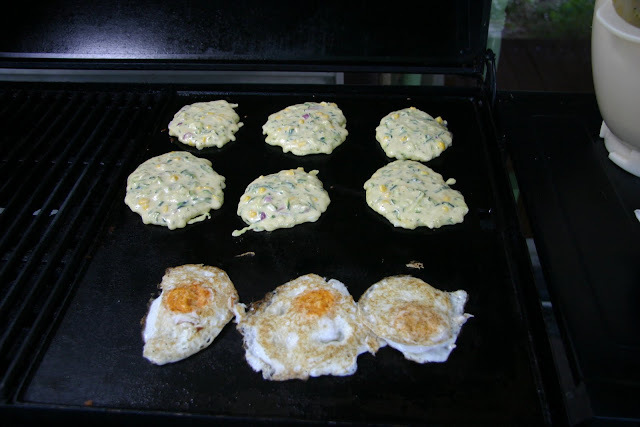 Fry in olive oil - dollop spoonfuls on bbq, wait until cooked through when turning, cook on medium heat until golden brown. The BBQ was great for dealing with such a large quantity. Not the classiest of food pics. I only thought of taking a picture after I went back for seconds, so my sauce is all smudgy (it's really thicker than it looks in the picture too). 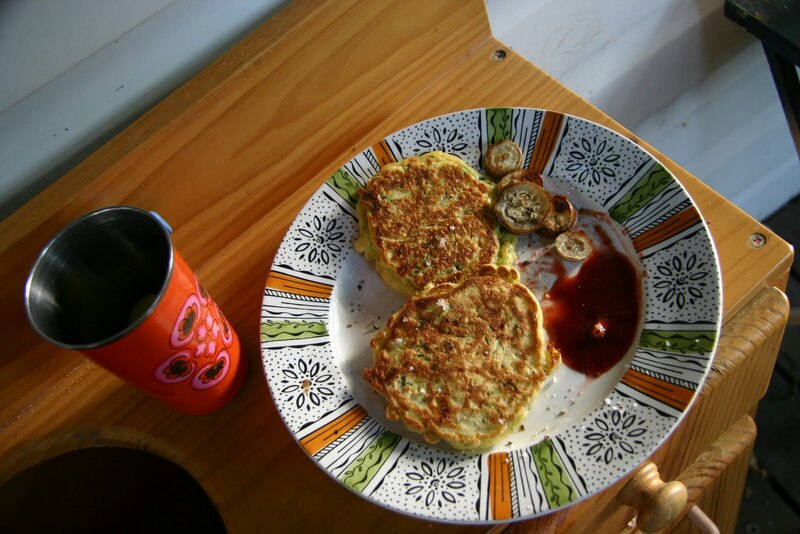 Zuchinni fritters with grilled eggplant (a pretty purple and white Fairy variety) and Asian plum sauce. We knocked over this bottle in a week. Chopped in a putanesca sauce. I don't reallly like stuffed zuchinnis, they are a bit to mushy for my tastes, but if anyone has a recipe to convert me please forward it on. In fact please link any special zuchinni recipes you may have. Zuchinni growing technique - in November dig grass and a big hole in the ground. Plant mulberry (grown from a cutting bought on Ebay) and surround with newspaper covered with 5 bags of horse manure. 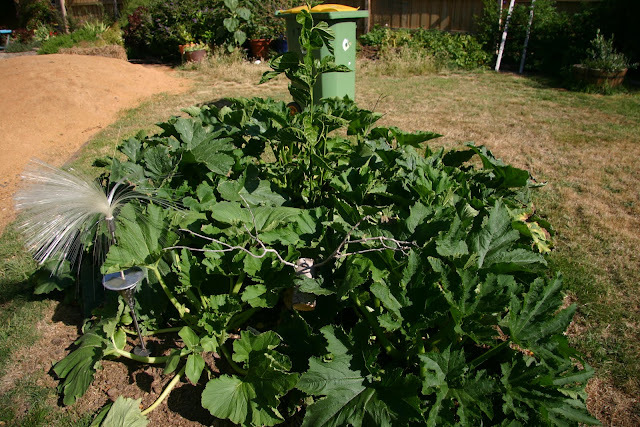 Plant zuchinni seeds in pockets of soil around mulberry - about 3 seeds in each pocket - seeds took about a week to come up - some were fortuitously stolen by cockatoos. Almost all seeds germinated. After - a very happy mulberry and thriving zuchinnis. A great way of establishing a fruit tree as you remember to feed and water it in it's early stages. After - rudolph is coverd in deep zuchinni shade. 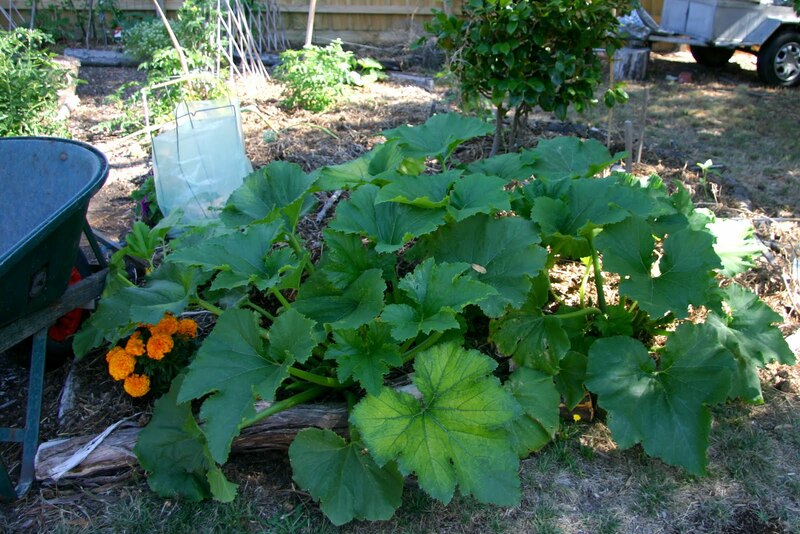 And the extra patch of squash I had to create because I can't be ruthless with unnecessary seedlings. Well none have gone to waste yet. This is another Tuesdays with Dorie rewind recipe from the early days of TWD. I decided that starting this week I would start back at the beginning of the book and try to work my way through the recipes that I missed in the order they appear in the book. I'm planning on doing this on the "off Tuesdays" since next week we will start the new TWD group with the book, Baking With Julia (so excited!) and only post every other Tuesday. 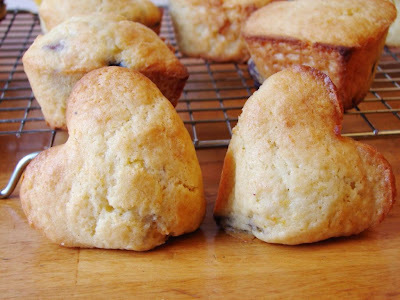 The first recipe in the book is Orange Berry Muffins, these sounded so delicious and I was happy to give them a try. 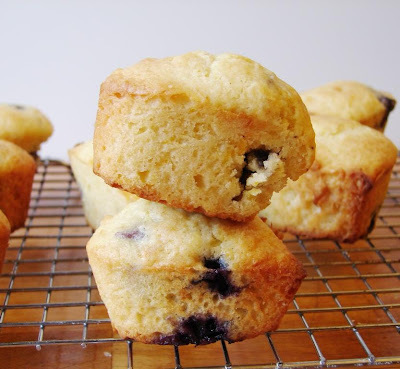 I love oranges and blueberries, and the recipe calls for buttermilk, which I love using in baked goods for that extra moist crumb. Center a rack in the oven and preheat the oven to 400 degrees F. -- I had my oven temperature at 350, I like my oven temp a little lower when I'm using silicone bakeware, just personal preference -- Butter or spray the 12 molds in a regular-size muffin pan or fit the molds with paper muffin cups. 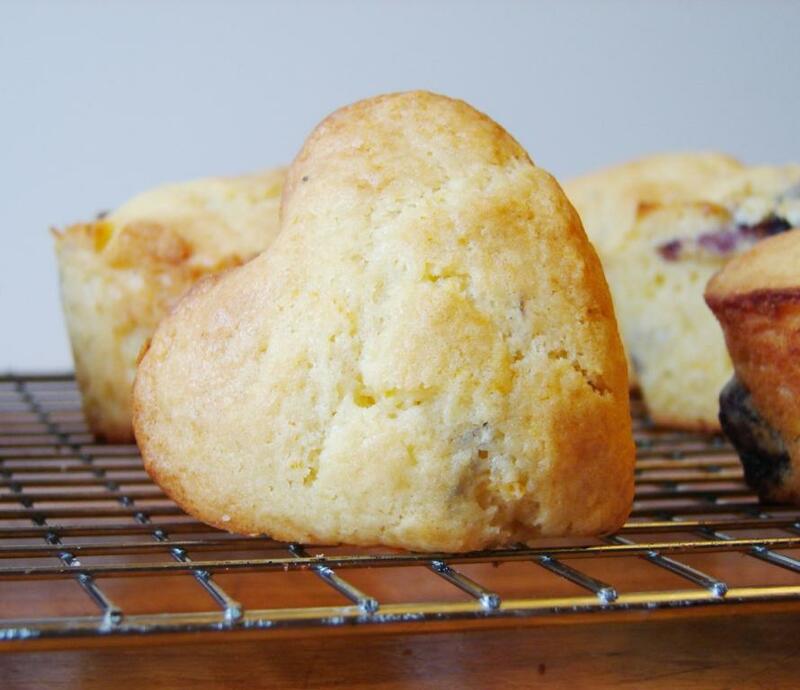 Alternatively, use a silicone muffin pan, which needs neither greasing nor paper cups. 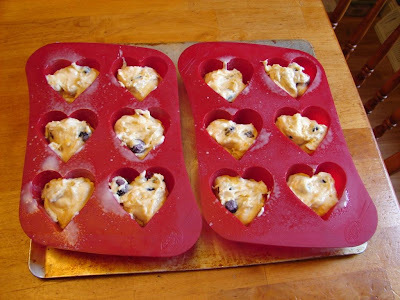 Place the muffin pan on a baking sheet. 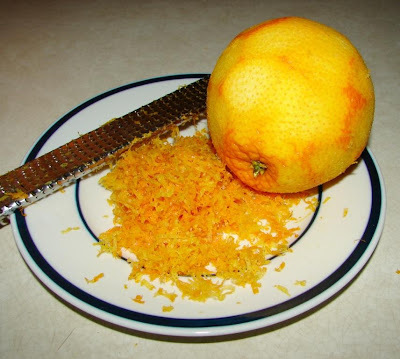 In a large bowl, rub the sugar and orange zest together with your fingertips until the sugar is moist and the fragrance of orange is strong. Whisk in the flour, baking powder, baking soda, and salt. Pour the liquid ingredients over the dry ingredients and, with the whisk or a rubber spatula, gently but quickly stir to blend. Don't worry about being thorough - the batter will be lumpy and bubbly, and that's just the way it should be. Just a note, don't leave any clumps of dry flour. Stir in the blueberries. Divide the batter evenly among the muffin cups. 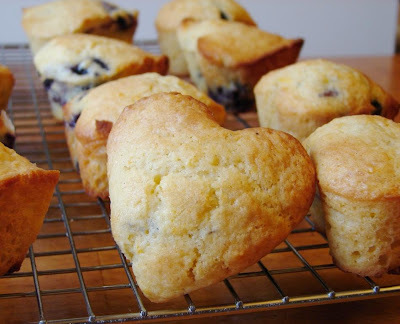 I had enough for two pans of heart muffins and a small pan of mini muffins. As promised, a tail tutorial to go with the Unicorn Horn Flower Crown. 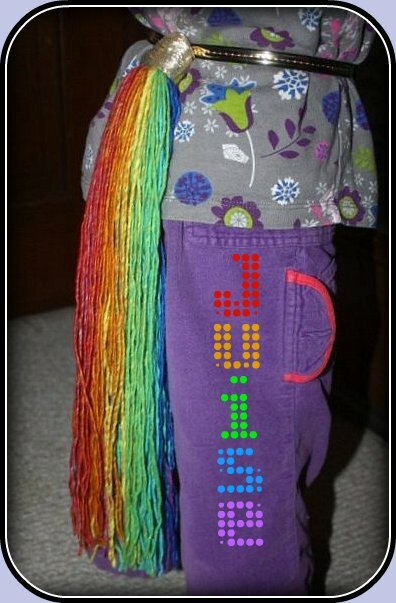 This tail is a very simple and quick project, and certainly isn't limited to unicorns or rainbows. 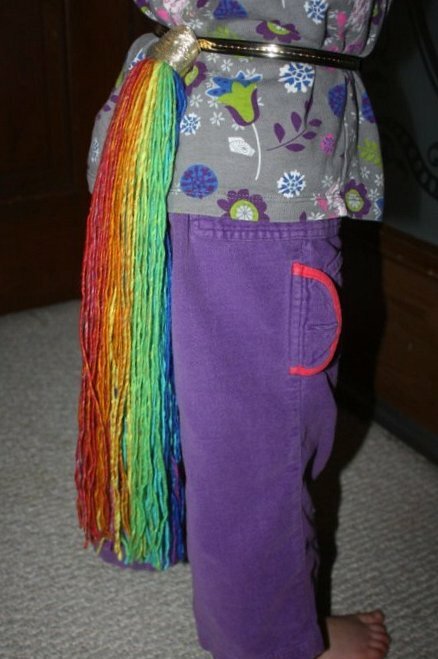 Kaia specifically wanted a rainbow tail for her unicorn costume, and I thought keeping the bands of colour separate would have more rainbow impact than the strands all being mixed together. 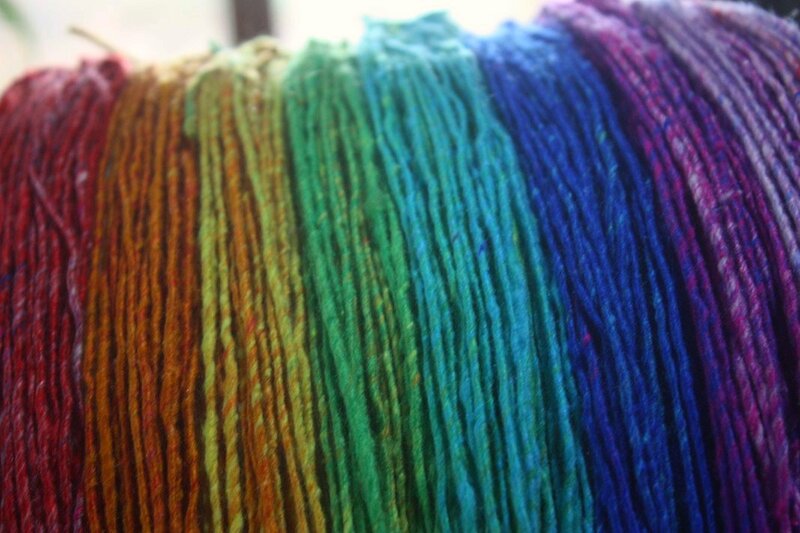 We picked out Bernat Mosaic Yarn - Psychedelic, their Calypso version is nice, too. 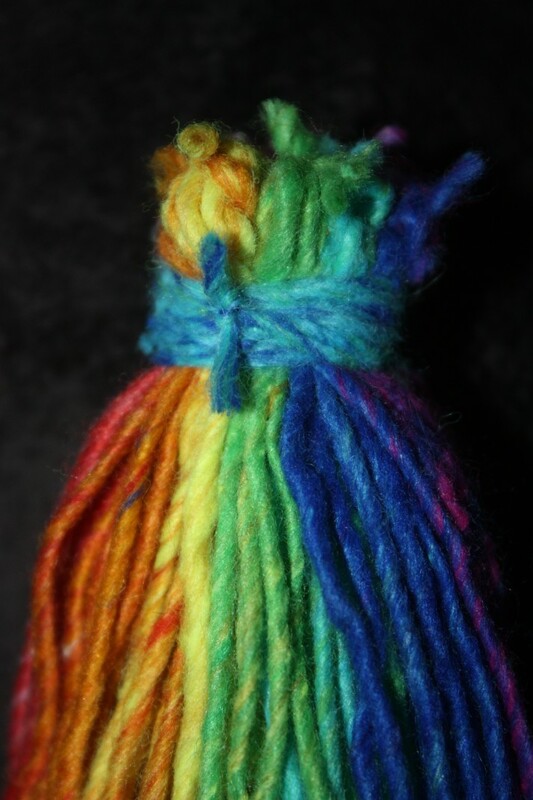 This yarn has its colours in long sections, so as I pulled the yarn off the skein I wrapped it into equal lengths. 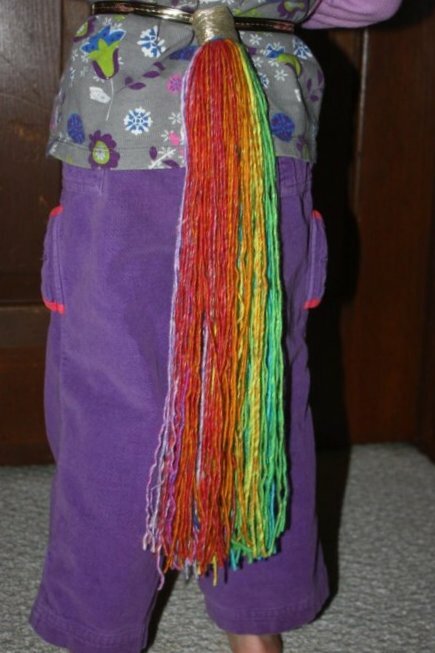 This is pretty easy to do by wrapping your yarn around a book, but Kaia wanted a very long tail, one that came all the way to her feet. 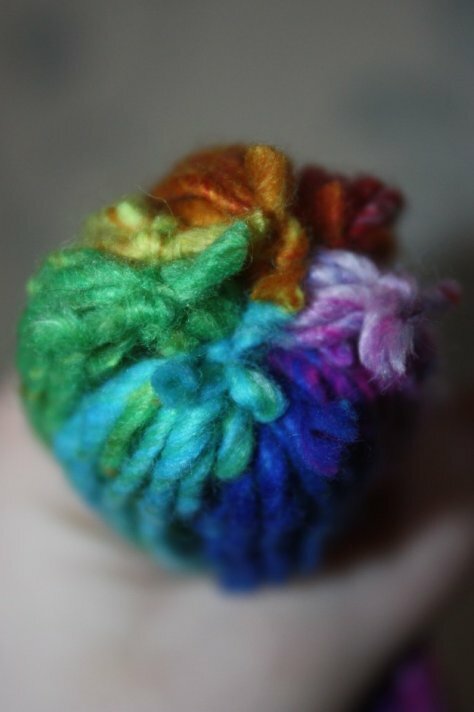 I held one end of the yarn in my hand, and wrapped it around a crochet hook I held between my knees, back and forth, between hand and hook, until the yarn started to shift to the next colour. Then I cut it. 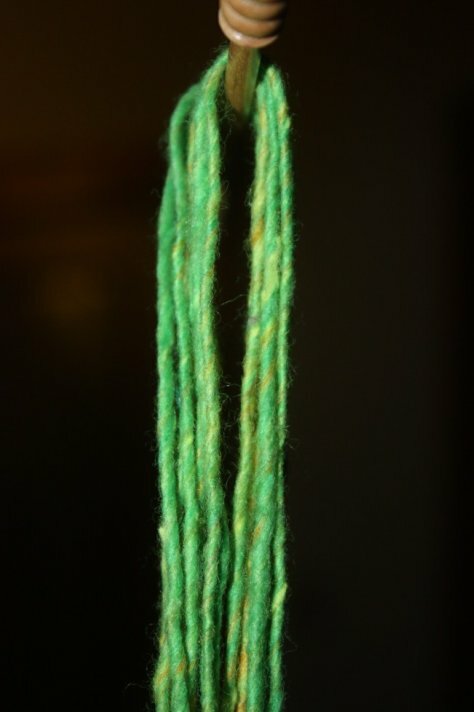 Make sure both cut ends come out on the same side, even if it means chopping off a little section of yarn before starting your next colour, so that one end of your yarn has only loops. 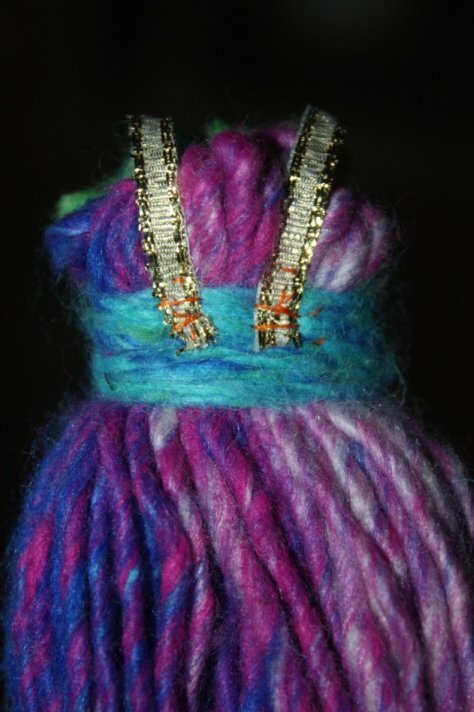 Use another short length of yarn to go under and around the loop end, and double knot it. Trim the knot ends short, (but not so short that your knot might slip out.) Do this for each colour. You will have a separate bundle for each colour. 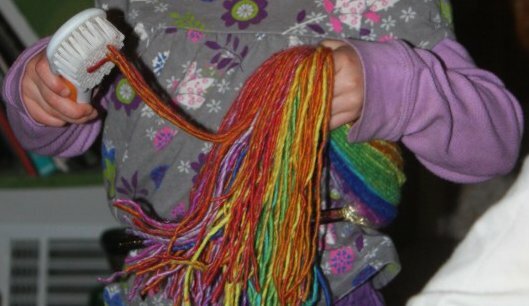 Once you are through gathering your colours into bundles, run another, longer, length of yarn through all of them and tie them together. 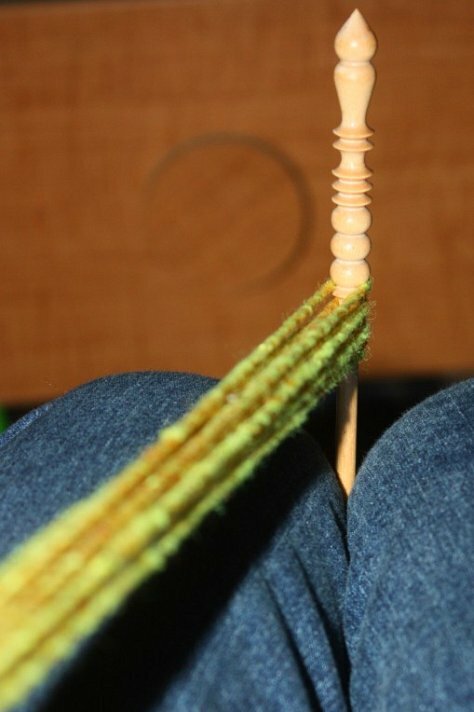 This length of yarn goes through the top loop, just as you did for the separate bundles, right under the short length of yarn you already tied. 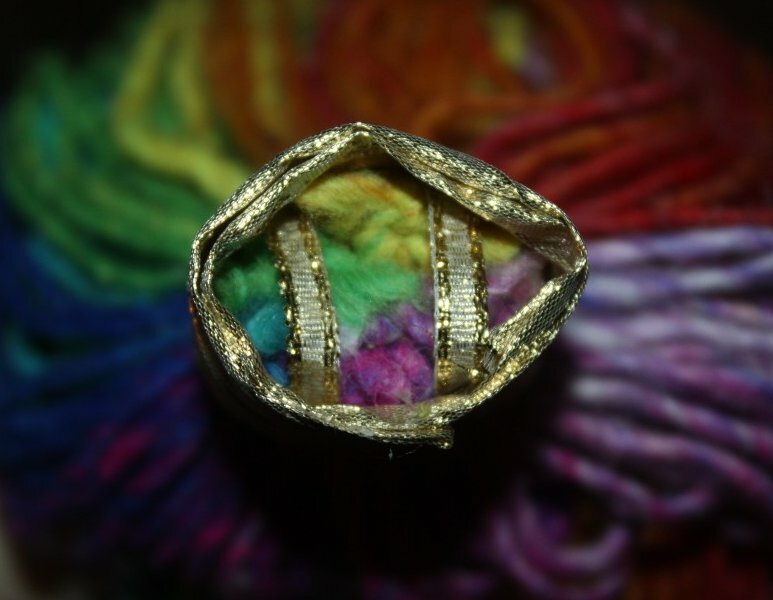 Now the bundles are all tied together on the inside. 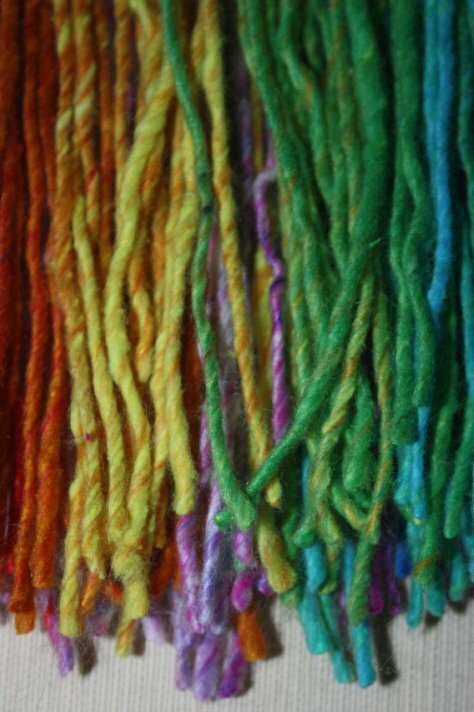 Wrap yet another length of yarn a handful of times tightly around the outside of the bundles, just below the knots, and double knot it. This sucker is not coming apart. Cut the loops off the bottom end of the tail, and trim them more evenly. I hadn't trimmed yet in the following photo, but when I did, I cut it in staggered layers so they wouldn't all be precisely the same length. Cut two short lengths of cloth ribbon and ready your needle and thread. 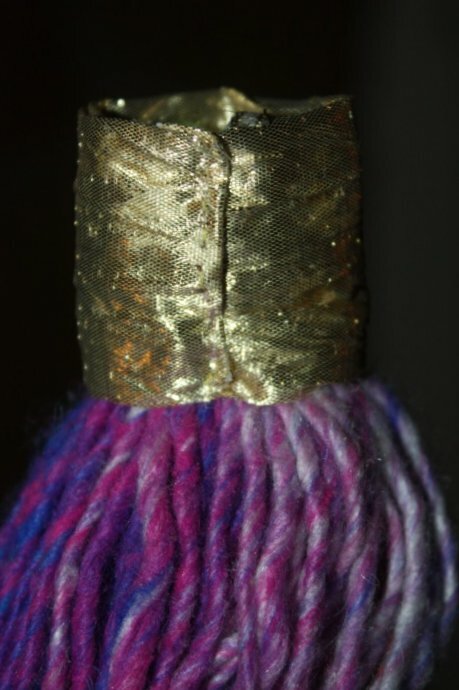 Wrap the ribbons loosely over the knotted end of your tail, and tack very securely into place. 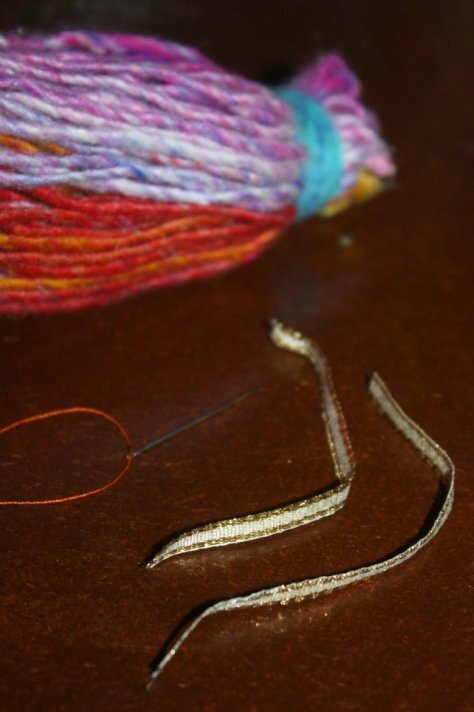 I sewed through the yarn wrapping the end and all the way through the tail. Okay, I didn't do a very pretty job, but it is very secure, and it will not be visible. These are so you will be able to put the tail on a belt. 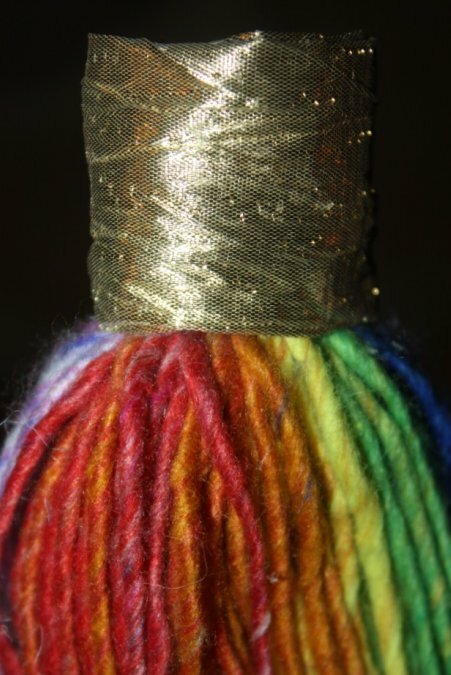 Put a little tacky glue on the yarn wrapping the knotted end of the tail, and put the wide cloth ribbon around it. Make sure the seam is where you want the underside of your tail will be.Turn the cut end of the ribbon under before tacky gluing it down, and then stitch it in place. My ribbon was wider than I liked, so I actually turned the long edges of it under as well. 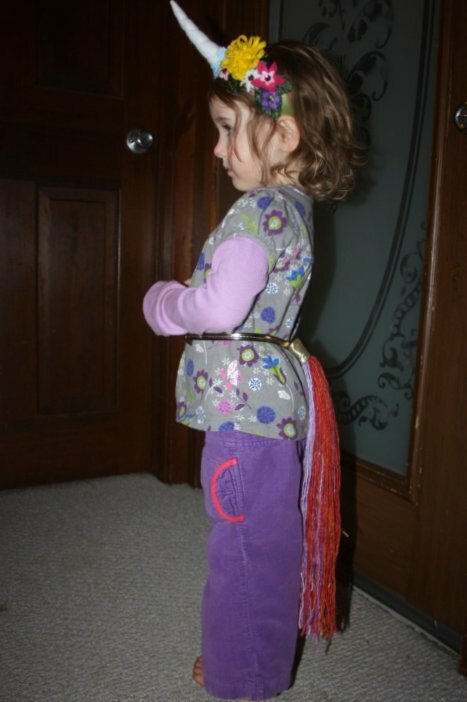 Your tail is ready to thread a belt through! 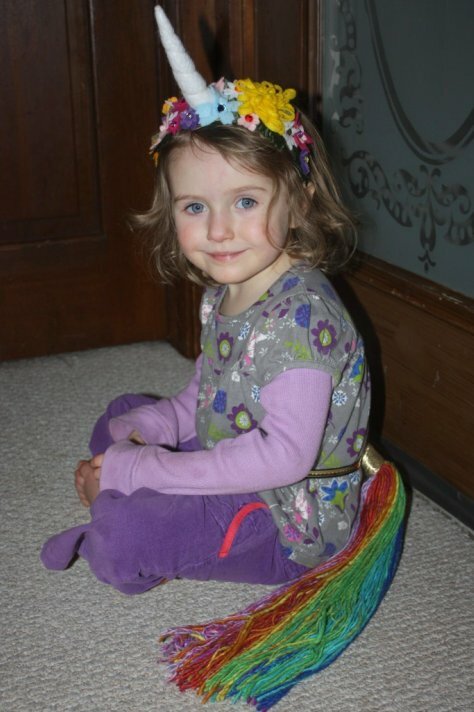 Kaia is as happy as can be with her new unicorn outfit, and I really like the way tying each colour individually keeps the colours in distinct bands. 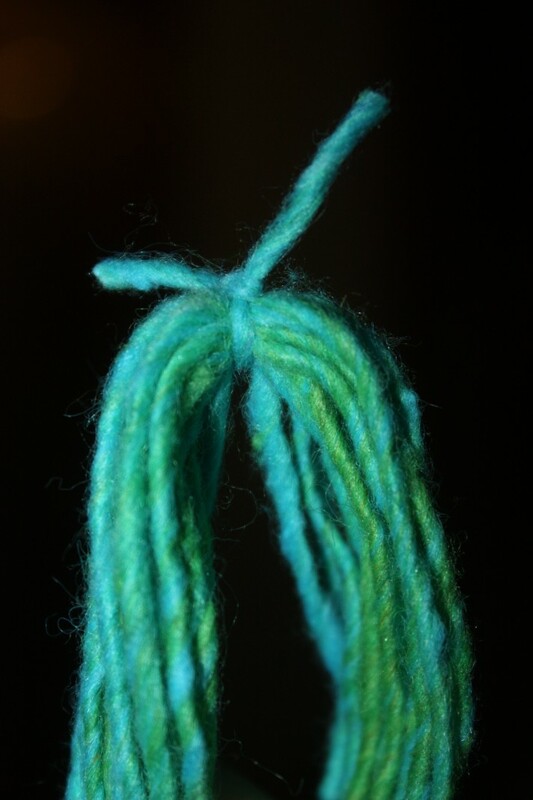 Honestly, I think I would still tie smaller bundles even if I were making it all one colour, just because of how much more securely attached the strands of yarn are this way. She's been galloping around non-stop, and if I thought it was hard to get her to stand still for photos in her headband, it was next to impossible in the full getup! Her tail has stood up to being brushed no problem, with not a single strand lost. As always, I would love to know if you tackle this project, and especially if any part of the tutorial is not clear. 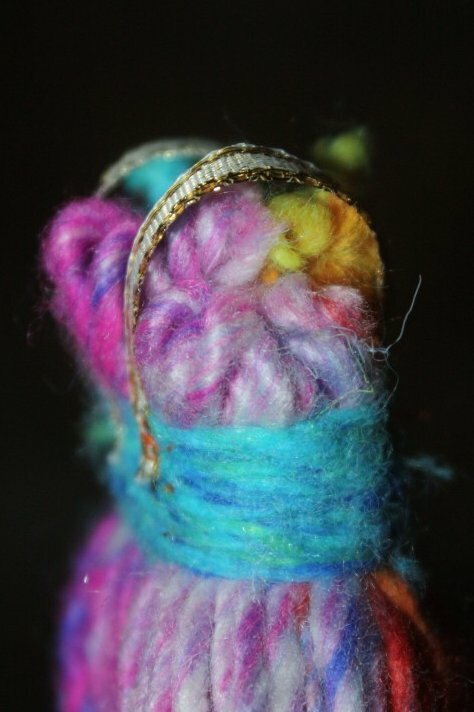 In case you missed it, I linked up to the unicorn horn flower crown at the beginning of this post. They make a fun set!